Successfully Added Two DIN Car Media Player - For Land Cruiser, 10.2 Inch, Android 8.0.1, Bluetooth, GPS, WiFi, 3G&4G, Octa-Core CPU, 4GB RAM to your Shopping Cart. 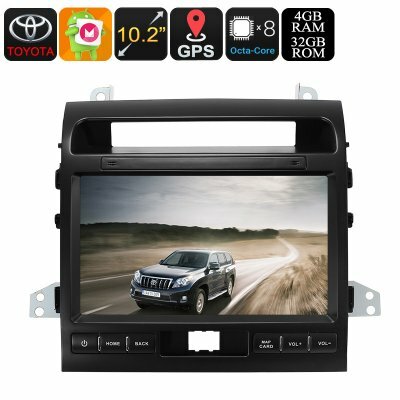 With this 2 DIN car stereo for your Land Cruiser (Model 2013 – 2017), you’ll be able to hit the road and never fear about getting lost again. Its 20 channel GPS system provides with accurate readings on your position no matter where you are. Simply insert the Android map of your liking, and this car navigation system will show you the fastest route to your upcoming destination. The Android media player features a simple design that can be installed without needing any technological knowledge. Once in place, it will not only provide you with accurate GPS readings but also with tons of other Android entertainment options. Thanks to its Android 8.0.1 OS, this Two DIN car media player brings along plenty of fun. Your passengers will never have to feel bored again as they will be able to watch movies and play games straight from your dashboard. Additionally, this car stereo even lets you browse the web thanks to its WiFi and 3G dongle (not included) support. This means that you’ll always be able to stay connected to friends and family back home or download the newest entertainment from the Play Store. With an Octa-Core processor and 4GB RAM in place, this Android media player handles all the basic software features out there. The large 10.2-Inch display of this car stereo offers you a great platform from which to enjoy your favorite media. It treats you to 1024x600p HD resolutions. This means that you’ll be spoiled with vivid color and crisp details at any time. Your car media player is even capable of decoding 1080p Full-HD media, thus letting you watch and enjoy the latest movies and series in all their glory. With 32GB internal memory, there will be plenty of space for you to store your films, games, and maps. Additionally, this 2 DIN Android media player supports external data inputs via its USB and SD card slot.